DANDONG - North Korea was in seclusion on Tuesday, a day after it announced the death of its leader Kim Jong-il, as concern mounted over what would happen next in the deeply secretive nation that is trying to build a nuclear arsenal. While Secretary of State Hillary Clinton urged North Korea to follow a "path of peace," diplomats and commentators were struggling to understand what would happen as it transitions from the 17-year iron rule of Kim Jong-il, 69 years old when he died, to that of his untested son, in his late 20s. New ruler Kim Jong-un paid respects to his father who lay in state in the capital of Pyongyang ahead of a December 28 funeral after North Korean media reported he had died on Saturday. "Kim Jong Un ... together with senior officials of the party, state and armed forces organs, visited the bier of Kim Jong-il to express deep condolences with the bitterest grief," North Korean state news agency KCNA said on Tuesday. North Korean media lauded Kim Jong-il as the "Great Father of the People" and reported that he had made several public appearances in the past week. 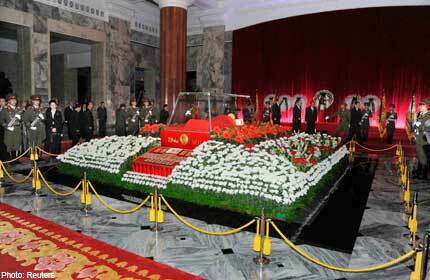 Pyongyang has said foreign officials will not be invited to the funeral. Jong-un, the youngest son and successor to the ruling dynasty started by his grandfather, was described as the "eternally immovable mental mainstay of the Korean people" by KCNA. In a sign the hermit state was sealing itself off from the outside world even more after the "Dear Leader's" death, few people crossed the Dandong border with China. China is the North's only major ally and one of the few states with which it actively trades. "We can't go in now, because of the death of Kim Jong-il," Yu Lu, a Chinese trader in Dandong who does business with the North, told Reuters. "It's all closed off, and basically all the North Koreans are heading back. It's very tightly closed today." However, it was not clear if the border was officially closed. Chinese business people in Dandong said that while it was still possible to travel across on Tuesday, many were cancelling trips, fearing the border could be closed. "We're worried that it could be shut down at any time, because of the mourning activities, and nobody wants to be stuck in North Korea with the border closed," said Yu Lu. The elder Kim was reported to have died on Saturday of a heart attack, prompting South Korea - with whom the North remains technically at war after a 1953 armistice ended a conflict - to put its forces on full alert. South Korean media reported that the North test-fired at least one short-range missile on Monday, sparking a fresh round of tension, although government officials in Seoul said they did not necessarily believe the launches were linked to Kim's death. Seoul was calm on Tuesday, a sunny winter day, and there appeared to be no sense of any crisis. One Chinese businessman with close links to North Korea, who could not be identified due to the sensitive nature of his relationship with the Pyongyang elite, said that the Wongjong border crossing with Russia was open, but that no one was using it to enter the country. "(As) many foreigners are leaving as possible," he said.